If you regularly catch colds and flu’s you may have an imbalance in your immune system which may make you more susceptible to infections. A poor diet, nutritional deficiencies and/or a lack of exercise can all lead to these imbalances in your immune system. A strong immune system can help to protect you from potentially harmful invaders, such as viruses and bacteria, by recognising and responding to them as a threat. Can Viruses Can Cause Colds and Flu’s? Contrary to popular belief, viruses cause colds and flu’s – not bacteria. Viruses are minute infectious agents which invade and hijack your cells. The immune system recognises viruses as invaders and attempts to destroy them before they can invade your cells. If the immune system is out of balance however, it may not have the ability to destroy viruses and viral infections can occur. 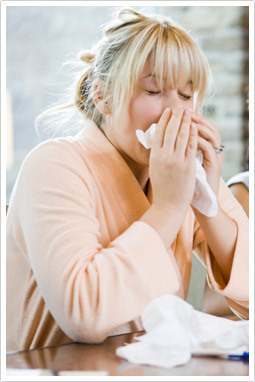 Common symptoms of viral infections include sore throat, fever and fatigue. How can Melbourne Anti-ageing Clinic Naturopaths help? If your immune system is struggling to defend you, don’t despair – Natural Medicines may help! Particular herbs and nutrients may help you to manage your cold and flu symptoms naturally, as well as improving underlying immune imbalances. The following herbs and nutrients may be beneficial for fighting colds and flu’s. By making some simple changes to your diet and lifestyle and by taking the appropriate supplements, you can reduce your risk of catching colds and flu’s. Speak to us about the best way to manage or prevent your colds and flu’s naturally. Take a proactive approach and consult one of our highly qualified naturopaths at MNMC today. By making some simple changes to your diet and lifestyle and by taking the appropriate supplements, you can reduce your risk of catching colds and flu’s. Speak to us about the best way to manage or prevent your colds and flu’s naturally. You can make an appointment online, email us, or phone us on (03) 96862566. Our clinic in 49 Chetwynd St, North Melbourne, is open six days a week.